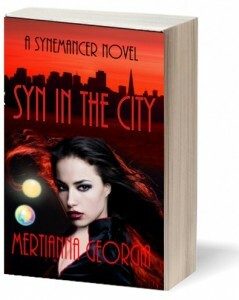 In my book, SYNEMANCER, a powerful demon is summoned by a group of men. They think they’ll be able to control it. But it’s too powerful for them to control and now that it has returned to earth, it wants to bring back “the good old days” of human sacrifice. The demon had been on earth before and was once worshipped as the Aztec god Tezcatlipoca. Tezcatlipoca was a central deity in Aztec religion, associated with a wide range of concepts including the night sky, the night winds, hurricanes, the north, the earth, obsidian, enmity, discord, rulership, divination, temptation, sorcery, beauty, war and strife. His name in the Nahuatl language is often translated as “Smoking Mirror” and alludes to his connection to obsidian, the material from which mirrors were made in Mesoamerica and which was used for shamanic rituals. When depicted he was usually drawn with a black and a yellow stripe painted across his face. He is often shown with his right foot replaced with an obsidian mirror or a snake – an allusion to the creation myth in which he loses his foot battling with the Earth Monster. Sometimes the mirror was shown on his chest, and sometimes smoke would emanate from the mirror. Mirrors also play a key role in the book. Sign Up Below to Learn About Upcoming Giveaways & Contests. I respect your privacy, and I don't spam!